Today, Civilization VI comes to Switch, which means two important things. One is that you can now play an incredible strategy game anywhere you’d like. The second is that Gandhi now qualifies for Smash. The good news is that the game seems to run great. I’ve tested out a few matches and while it takes some time to adjust to the controls, the performance is smooth. 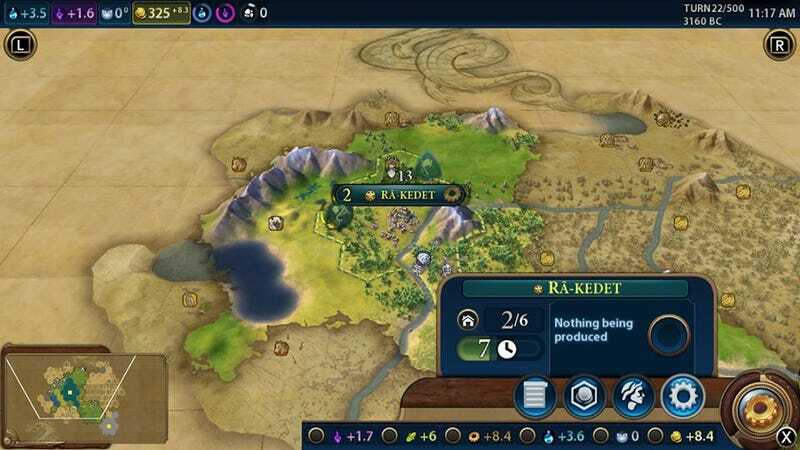 There are no severe loading times or framerate drops—it’s just Civ VI, running on a Switch. Playing a game like this with buttons and joysticks will never be as ideal as using a mouse and keyboard, but once you find the rhythm in each turn, it feels pretty good. You use the bumpers to access key information, the X button to zip between new actions, and the A button to highlight things on the map. It’s all intuitive. So that’s the tradeoff. For $60 you’re getting a pretty good port of Civ VI, one you can take anywhere you’d like or play on a big screen, but one that’s inherently inferior to the PC version. Is the portability worth it? That’s up to you.